The McAvoy Group has handed over a new passenger facility at Dublin Airport which was built offsite and at over 19m wide, is believed to be the largest single span modular building delivered to date in the UK and Ireland. 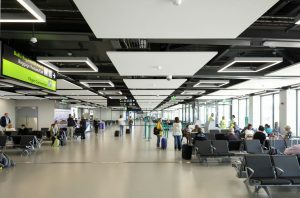 The new €22 million South Gates passenger boarding area has been developed to meet the huge growth in passenger numbers at Dublin Airport and will be used mainly by Aer Lingus for flights to the UK and continental Europe. It provides seven boarding gates to serve nine aircraft stands and is designed to accommodate around 8,000 passengers a day. The management contractor for the project was Flynn Management & Contractors and the lead consultants were Arup. The building was designed by concept architects Kavanagh Tuite and delivered by project architects Blue Sky. The 2,200m2 facility was constructed offsite at the McAvoy production centre in Lisburn, Northern Ireland to reduce time on site. It was craned into position in 16 days as 77 steel-framed modules. The building system was engineered to achieve over 19m wide uninterrupted clear spans, which is believed to be an industry first for modular construction. Hot rolled steel beams were used to remove the requirement for internal columns. The building, which is around 120m long, has the flexibility to accommodate departing flights in the busy early morning period and flight arrivals in the evening. It can also be segregated so around 1,000 departing and arriving passengers can be processed at the same time. Facilities include boarding gates, a café, toilets, baby changing and a workstation area with plugs and charging points. 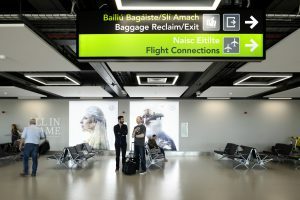 Dublin Airport has experienced a 6 per cent increase in passenger numbers in the past year and a record 29.6 million passengers used the airport in the last year. McAvoy has already been shortlisted for two industry awards for the Dublin Airport project and its innovative use of BIM and virtual reality. The Dublin Airport scheme was designed to meet stringent fire safety regulations that exceeded Building Regulations. All mechanical and electrical services – including data communications, fire and security – had to link into the existing live airport terminal systems, which was a hugely complex operation undertaken by McAvoy. A specially-designed ceiling solution provides a high standard of acoustics and its chequerboard appearance has created a strong visual feature. 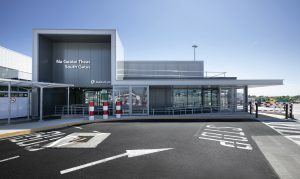 Externally, the highly glazed building is finished in two shades of anthracite grey aluminium cladding to complement the other passenger terminals. A screen of grey louvres wraps around the roof to conceal services and the plant rooms. For further information, call 028 8774 0372 or email info@mcavoygroup.local.